I originally went outside for a little natural inspiration. Whenever I do that I have a hard and fast rule. If it rains or if the mosquitoes find me, I'm coming in. Going outside, camera in hand, I walked around the yard. Thinking my usual wry comment of "this place would look so much better if someone lived here who knew how to garden", I bent down to get rid of some of the less welcome plants in the yard. Little white daisy looking things get everywhere. Some native plants don't really belong in the middle of the grass, and until Western Society realizes that not everywhere should look like a Bowling Green, grass is what we will have. Spotted by my neighbor, Bill, he knew I was looking for inspiration and briefly commented as he drove off to his own responsibilities. I went back to finding more weeds to pull. I have some plants here that were here long before I moved in. Doing what I have always done, I took some cuttings of pretty much anything there that I liked. Some sprouted immediately. Others withered away. 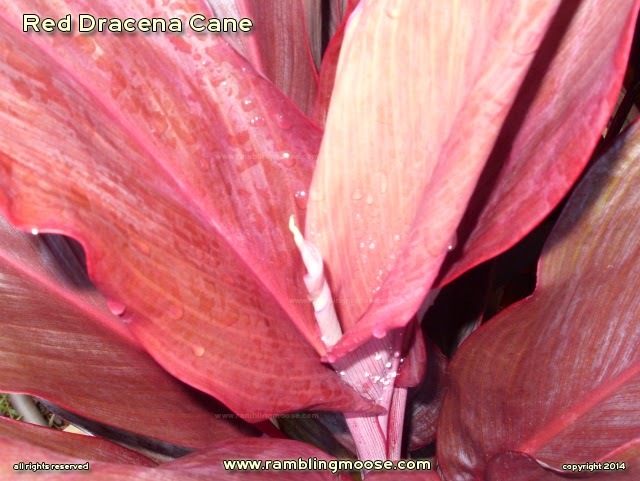 One that did well was what I think of as a Red Dracena Cane. It was planted where it was specifically because Lisa liked it. Now that has become Lisa's Stand Of Dracenas, and it will take a lot of coaxing to convince me to even attempt to trim it back. It came about because I got annoyed. I was being told that "I can't see out of the window, so if you don't trim those plants, I will!". Since Slash and Burn Agriculture is not my favorite, I got the cutters the next day and the stand of Dracena and its twin of Screw Palms, which are also Dracena, were born. When I was doing it, I had so much of it, I brought a bucket full of the things across the street asking Lisa "Do you want any of these weeds?". Lisa's eyes flashed and she gushed, "Oh Yes! I love those Red Ones! As many as you can spare!". She took a solidly packed 5 gallon plastic bucket of canes and started sticking them all over the property. I'm sure it was too much and some ended up in the bins, but I'm fine with that. It made her happy and that is all that counts. I took her comment to heart and planted a stand in a spot in front of my yard in a spot so my friend could see them when she walked out front to do something in the yard, or if she was just going for a ride. Her stand of Dracena went from 2 feet to now over 7 feet in a year. I'm lucky they don't spread. They're getting so big now that they've outgrown the more common green Screw Palms on the other side of the island garden in the middle of the yard. I'm beginning to see what Lisa saw in these things. Going around the yard pulling long thing strands of what the midwest Farmers call Stink Weed off my podocarpus, I thought it best to leave well enough alone. No, the Dracena won't get cut today. Lisa's Stand will remain guarding the house, the palm tree and looking over us and the green lizard I saw in them earlier. Maybe they will eat the mosquitoes. Maybe not. So? How about some weeds?